Blackmagic Forum • View topic - Blackmagic RAW on the Ursa Mini 4.6k? Blackmagic RAW on the Ursa Mini 4.6k? 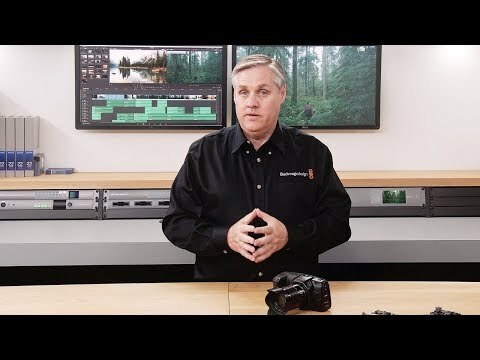 Re: Blackmagic RAW on the Ursa Mini 4.6k? pprokhor wrote: I couldn't wait any longer and swapped my 4.6K for the Pro. I loved my 4.6.. I had it the second it started shipping and I used it a lot never hating anything about it. BRAW was the second main reason to switch. If someone is going to pull the trigger on that, call Adorama Used Department, tell them you want to sell your URSA and purchase Pro from them right away and they'll give you a very nice deal. They give you shipment label → look at the camera → you pay the difference → now you can use BRAW (which is the only thing I use know since whole post-production environment is DaVinci anyway). As much as I understand the swap from 4.6K to Pro, I still can't justify doing it since I've got a suspicion that a new URSA Mini will be announced at NAB this year and I'd rather wait for that. At this time it makes more sense to go from UM4.6K to UM-2019 than the Pro. We'll find out in less than two months of course. Yet, I'm still going to hold out hope for the UM4.6K to get BRAW. Well, I made the purchase/swap back in December knowing that I will be using PL lenses many times until April's NAB (my 4.6k was EF), so that move wasn't ONLY for BRAW. But yes, Vegas show was such a big announcement opportunity for BMD in the past couple years — it's definitely worth the wait for someone looking at cameras now. Database (PostgreSQL) and media are on QNAP via T3, NFS. At today's Orlando Blackmagic Expo and Resolve Sessions I talked with a few Blackmagic reps. First, they don't have any word on whether they UM4.6K will get BRAW, but most suspected it should since it has the same sensor as the Pro. They also expect BRAW to come to the Pocket 4K soon. Meanwhile I mentioned some of the things I want to see in the next URSA Mini 4.6K model and they agreed those are some to dream of features. Things I mentioned was 120 fps at 4.6K, Dual ISO, and GPS & Gyroscope finally integrated. One even said that the engineers were disappointed they couldn't get GPS & Gyroscope to work out in the original URSA Mini 4.6K, and that it is likely still on the shelf of things they'd like to try to achieve. When I mentioned BRAW taking the gyroscope metadata over to Fusion for camera tracking they agreed that would be a great additional to the toolset. So I continued to plant ideas in everyone's heads while also making clear the desire for the UM4.6K to get BRAW. Meanwhile the Resolve Sessions were great and I got to have hands on the Pocket 4K. So tempted to buy one now, but I'd rather save for that next URSA Mini. Lets's hope BRAW comes to the UM4.6K the same day it comes to the Pocket 4K! Thanks, Tim. Your language here reflecting your conversation with the reps appears to indicate BRAW will arrive on the BMPCC4K before the URSA Mini 4.6K. That would be in keeping with Grant Petty’s video announcement for BRAW. Rick, are you using that Crystal Ball again? rick.lang wrote: Thanks, Tim. Your language here reflecting your conversation with the reps appears to indicate BRAW will arrive on the BMPCC4K before the URSA Mini 4.6K. That would be in keeping with Grant Petty’s video announcement for BRAW. The BMD reps in Seattle said it was coming soon also... but nothing more definite than that. NAB 2019. They will announce Pocket 4k BRaw, a slim possibility they also announce Ursa mini 4.6k BRaw Or it will be just after NAB for the Ursa 4.6k. IMO. There are at least two sources confirming what’s been in the air for some time. Braw is coming soon. We probably see big posters and sign at NAB inscribed “BRAW” in big bold letters. As DNxHR was just brought up in another thread, I will note that while at the Expo portion in Orlando I looked at the UMP on hand. Where DNxHR is greyed out on the UM4.6K the UMP now has Blackmagic RAW. Thus, it's clear that when the UM4.6K gets BRAW it will replace the greyed out DNxHR. And, I have to say that's great since with DNxHR never being implemented I'd rather take Blackmagic RAW. Obviously BRAW needs to be supported in editing apps like Adobe and Avid, but since the SDK is available it should easily happen. It would be stupid for both Adobe and Avid to not include support as it would drive away a large number people right into DaVinci Resolve. Although, that's not a bad things since I love editing in Resolve. Overall, we have March for an update to come. Maybe in the final days of February it might also come, but at least there is March. NAB is getting closer with April approaching. I would like to hear from Blackmagidesign just one answer- How much we have to wait, to get BRAW on Ursa mini 4.6K... There are a lot of users out there who are using this camera. My understanding of why it's a plugin is that Adobe wants to encourage more third party API plugins for Premiere, so they are supporting the use of this rather than adding BRAW decode to Premiere themselves. And, this is exactly why I left Adobe Premiere Pro. I hate the need for all the Third Party Plugins. I only hurts you when updating the software and doesn't lend itself to future proofing a project. I still have issues with Element 3D on the latest version of After Effects because Video Copilot hasn't updated the plugin. Thus why I'm all for moving to Fusion inside Resolve. DaVinci Resolve is my main editing platform anyways, so I just want BRAW on my UM4.6K and I'll be happy. Some awesome updates today. Pocket 4K gets BRAW, plus URSA Mini Pro 4.6K G2! But also, CinemaDNG removed from the URSA Mini Pro & Pocket 4K! I think that one was important because of what Grant says about patents regarding DNG in the video. I'm still watching, but I hope this means the original UM4.6K will get BRAW due to it still shooting it. Of course now I'm going to focus on the new URSA Mini Pro G2. I just got a new laptop, so pay that credit card debt off first. But then, I'll definitely update. In the meantime it would be great to have BlackmagicRAW on the original URSA Mini 4.6K. I hope that's next on the firmware update list. Thank you Blackmagic Design! The UMP G2 sounds amazing! Blackmagic equipment certainly Inspires me to create great film. Well done BM ..oh and yes please BRaw on my Ursa mini 4.6k would be the cherry on the cake. Now that there is a patent claim leading Blackmagic Design to remove cdng formats from the UMP and the compact, I am hoping that they need to look at the older camera's as well. Hopefully this patent claim will finally be the push for them to add it to the 4.6k. Well, the next newer camera on the list is the Ursa Broadcast which has CDNG Raw on it, is that going to be replaced with BRaw? But I'm certainly not going to update my URSA Mini 4.6K if there is no BRAW in the update. Removing CDNG and not adding BRAW would leave it with ProRes only. I literally just saw this...DO NOT DOWNLOAD the 6.2 Firmware unless you do not want a RAW option at all on your 4.6k camera. Why would BMD remove a feature without offering an immediate replacement format?? Stephen Fitzgerald wrote: I literally just saw this...DO NOT DOWNLOAD the 6.2 Firmware unless you do not want a RAW option at all on your 4.6k camera. Why would BMD remove a feature without offering an immediate replacement format?? Because the update can't even be installed on the UM46K. So that is nonsense. And you always can downgrade to an older firmware. The 6.2 update does NOTHING to the Ursa Mini 4.6K. It’s only for the 4K Pocket and Ursa Mini Pro (removing CDNG Raw and perhaps updating BRAW to 1.2 to match the 4K Pocket). No need to worry. I can confirm that it is impossible to install Firmware 6.2 on the the URSA Mini 4.6K. So thus there is no way for the firmware to remove CinemaDNG RAW from the URSA Mini 4.6K. Anyone who has stated it as fact that the firmware does such is spreading fake news. I must have seen wrong, I apologize everyone. but that seems to be to much to ask. Please let us know. Blackmagic RAW on the Ursa Mini 4.6k..Will it happen? We’d all just like a yes or no, though I don’t see how the 4.6k is able to keep the CDNG. If the other cameras can’t have it. I won’t lie, I never use the CDNG, but that’s mostly because it’s not very flexible and large even at 4:1.
pprokhor wrote: It would be nice to know as soon as possible if it's even technically possible to get BRAW into URSA Mini 4.6k. If not, I will be swapping my UM to URSA Mini Pro, I guess. We hope so. Please bear with us. We have not forgotten you. As we said at IBC, we are working on finishing the general release for the Mini Pro. Pocket 4K will be next and we will also look at what other cameras we can get it into. The good news for the URSA Mini 4.6K is the sensor profiling work is already done. The URSA Mini 4K and the URSA Mini4.6K are still offered for sale by BMD. Ergo it is fair to expect updates however infrequent. When they no longer are promoted by BMD, it is fair to assume no more updates. The exception is a camera that replaces another camera such as the URSA Mini Pro G2 that immediately replaces the URSA Mini Pro. I fully expect some updates will still apply to the discontinued camera as long as BMD can manage subject to performance limitations. This is really very simple, if BRaw come to the UM 4.6, it will loose DNG, BRaw rep,acing the former Raw format. Until then or if never, DNG will still be the available Raw format on the UM 4.6 and older cameras. If you do not update a camera to BRW, you will keep the former Raw DNG format. BMD is just no longer selling new model cameras with CDNG Raw format on them, replacing it with BRaw from this day forward (UMPro G2 and Pocket 4K). You could also say the original UMP replaced the UM 4.6, even though the UM 4.6 and 4K continues to be available. That said, no one (except BMD) knows for how much longer they will keep making (if they have not already stopped) the UM 4.6 and 4K versions. The PL version of the 4.6 and 4K, and the original UMPro have already been dropped. Why are you all trying to make this complicated? rick.lang wrote: The URSA Mini 4K and the URSA Mini4.6K are still offered for sale by BMD. Ergo it is fair to expect updates however infrequent. When they no longer are promoted by BMD, it is fair to assume no more updates. The exception is a camera that replaces another camera such as the URSA Mini Pro G2 that immediately replaces the URSA Mini Pro. I fully expect some updates will still apply to the discontinued camera as long as BMD can manage subject to performance limitations. I just checked the blackmagic website. Only cameras promoted there are UMP G2, Micro Cinema, Pocket and Broadcast. You forgot the Ursa Brosdcast and Micro Studio Camera, also listed on the BM website. If you select the UM ProG2, and scroll down to the bottom, the other models of Ursa Mini Cameras are listed at the bottom with the price. Denny Smith wrote: You forgot the Ursa Brosdcast and Micro Studio Camera, also listed on the BM website. If you select the UM ProG2, and scroll down to the bottom, the other models of Ursa Mini Cameras are listed at the bottom with the price. Yeah, I hope the fact that they still have the URSA Mini 4.6K on the URSA Mini Product Page is a good sign. Plus you can still buy it new on B&H. So, I hope BRAW comes in the next two-three weeks. timbutt2 wrote: Yeah, I hope the fact that they still have the URSA Mini 4.6K on the URSA Mini Product Page is a good sign. Plus you can still buy it new on B&H. So, I hope BRAW comes in the next two-three weeks. In counting the days I see April 1 seems like a good day to release the update. No April Fools, just a great April Gift. I wish I had your optimism. Sadly I fear this potential update for the Ursa Mini 4.6k is I'm sure low on the BM to do list. Also bearing in mind how long has it been since there's been any software support for the Ursa Mini 4.6k. 2 years? It's not looking good I feel . There is an old saying if it is not broken, don’t fix it!. The UM 4.6 is working as designed, and produces some stunning images. So until BRaw came along, there was not any reason to have a FW upgrade. Any remaining issues with the camera are hardware related, like low level mic preamps, so FW updates will not fix this. So here is hoping BRaw does come to the UM 4.6... someday soon! DorisLondon wrote: I wish I had your optimism. Sadly I fear this potential update for the Ursa Mini 4.6k is I'm sure low on the BM to do list. My optimism exists because I'm positive that the URSA Mini 4.6K can do it. The sensor work already was done for the Pro G1 since it was the same sensor. It's just getting the Processor to work with it. I have a huge amount of faith. Also, since I am doing a camera workshop for a big networking event in Sarasota put on by the Sarasota Film Commission I would hope that by then I'm able to showcase BlackmagicRAW. Otherwise I'm presented outdated workflows with CinemaDNG. People will get more out of the Resolve portion. And, the UM4.6K is still a great camera. So I have faith and hope that it will happen. Otherwise, I'll be upgrading to the URSA Mini Pro G2 sometime later this year. But it won't happen before the event on April 24th. Denny Smith wrote: There is an old saying if it is not broken, don’t fix it!. Agreed! And, my camera works perfectly fine. The only thing that would be great is to kick CinemaDNG to the curb and use BlackmagicRAW from now on. It would be amazing! Although, as stated above I'll be considering updating to the G2 either this year or next depending on a few things. Updating is good Tim, but keep the UM 4.6 also, if you can afford to. Yes, getting BRaw on this camera would be grand. I also think is will happen, just because if this is a legally driven issue, the UM 4.6 is still in production, the UM Pro was the beta test platform (UM Pro V2 was already indesign), so it should rol, out next to the UM 4.6. The only delay, may be the tweaking time needed to port it to the new UM Pro V2 first. Tried today to install 6.2 (crossed fingers that it might work) but no luck. BMD still doesn't seem to have plans for G1 as G2 is out. I'm not positive about BRAW on this. Andrew Toul wrote: Tried today to install 6.2 (crossed fingers that it might work) but no luck. BMD still doesn't seem to have plans for G1 as G2 is out. I'm not positive about BRAW on this. Lol. Chancer!! Worth a shot. Lol . Love it. FW update 6.2 was for the new Pocket camera, not the Ursa Mini. FW 6.4 will be the one that brings BRAW to the UM4.6K. 6.3 will be implementing BRAW 1.3 to all the cameras that have BRAW already. Calling it now. Vegas setting odds at 15:2 on Timbutt’s bet.